The first foundation of DDA's success is a talented staff of degreed professionals coming from a variety of backgrounds, including writers, videographers, photographers, illustrators, animators, graphic designers, programmers, web developers, search marketing experts, and more. The second foundation of DDA's success is its creative utilization of the latest in digital technologies. DDA was the first full-service digital photography studio in Pennsylvania, and also one of the first full-service digital video producers in the state. 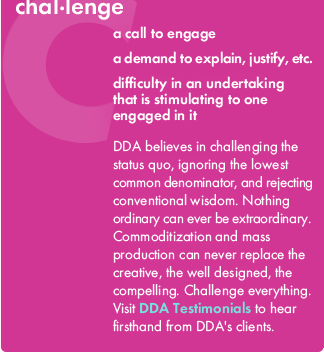 DDA pioneered the art of Search Engine Marketing in 1996, before the term was even widely understood. DDA continues to push the boundaries of technology, using custom programming to develop synchronous media like DDA's propriety Onlivemation™ or SmartSite™ technologies. Onlivemation™ integrates text, 2D animation, and video for a truly rewarding viewing experience, while a DDA SmartSite™ presents websites through coordinated text, images, audio, and video with easy-to-navigate animated menus and a modular design that lets the user select the media presentation combination they prefer. The diversity of DDA's website offerings is extremely broad. DDA can help your company or organization by developing an eCommerce website that will provide an easy and intuitive online shopping experience which will keep your customers coming back for more. DDA also creates Customer Relationship Management (CRM) websites and online applications that can transform how you do business, helping you to organize your contacts, plan for events, handle proposals for new business, or archive important audio and video broadcasts. DDA also develops intranets and Virtual Learning Environments (VLEs) to securely manage online communications and train your organization's staff. With a team of accomplished, professional programmers, DDA can ensure that whatever kind of website you need will be accessible across multiple platforms, including smartphones like iPhone, Android, Blackberry®, and Windows® phones, as well as tablets like the iPad, Android, and others. 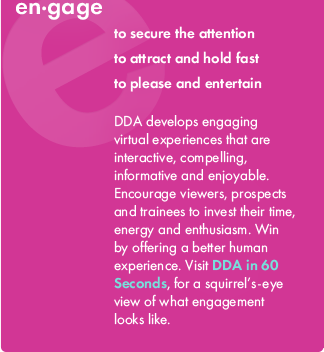 Utilizing the limitless potential of interactive and virtual technologies to improve upon existing methods of communication and interaction, DDA teaches, exposes, convinces, and engages in ways never seen before. 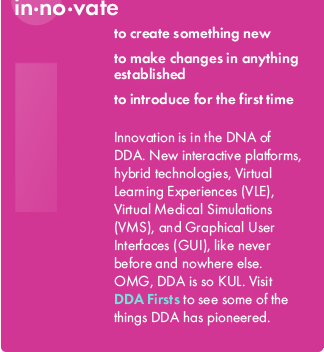 With such unique and groundbreaking methods, DDA is destined to remain one of America's most innovative technology companies. 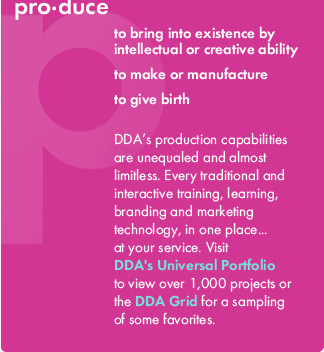 Contact us today to find out how DDA can propel your organization into the future.